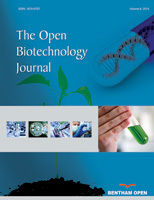 The Open Biotechnology Journal is an Open Access online journal, which publishes Research articles, Reviews and Letters and guest edited single topic issues in the field of Biotechnology, aiming at providing the most complete and reliable source of information on current developments in the field. This journal publishes open access reviews on recently published books (both print and electronic) relevant to the journal. Publishers and authors of books are invited to contact our book reviews editor at tobiotj@benthamopen.net with book review requests. All submitted books will be reviewed by an independent expert in the field. No page charges will be levied to authors for the publication of book reviews. The title of the article should be precise and brief and must not be more than 120 characters. Authors should avoid the use of non-standard abbreviations and question marks in titles. The title must be written in title case except for articles, conjunctions and prepositions. The abstract of an article should be its clear, concise and accurate summary, having no more than 250 words, and include the explicit sub-headings (as in-line or run-in headings in bold). Use of abbreviations and citation of references should be avoided in the abstract. Ideally, each abstract should include the following sub-headings, but these may vary according to requirements of the article. The main text should begin on a separate page and should be divided into title page, abstract and the main text. The text may be subdivided further according to the areas to be discussed, which should be followed by the List of Abbreviations (if any), Conflict of Interest, Acknowledgements and Reference sections. For Review Articles, the manuscript should be divided into title page, abstract and the main text. The text may be subdivided further according to the areas to be discussed, which should be followed by the Acknowledgements and Reference sections.The Review Article should mention any previous important recent and old reviews in the field and contain a comprehensive discussion starting with the general background of the field. It should then go on to discuss the salient features of recent developments. The authors should avoid presenting material which has already been published in a previous review. The authors are advised to present and discuss their observations in brief. If the research article reports the results of a controlled health care intervention, the trial registry should be listed, along with the unique identifying number, e.g. Trial registration: Current Controlled Trials ISRCTN73824458. Note that there should be no space between the letters and numbers of the trial registration number. For this purpose, a clinical trial is any study that prospectively assigns human subjects to intervention or comparison groups to evaluate the cause-and-effect relationship between a medical intervention and a health outcome. All clinical trials, regardless of when they were completed, and secondary analyses of original clinical trials must be registered before submission of a manuscript based on the trial. Studies designed for other purposes, such as to study pharmacokinetics or major toxicity (e.g., phase 1 trials), are exempt. Trial registry name, registration identification number, and the URL for the registry should be included at the end of abstract and also in the space provided on the online manuscript submission form. Authors must submit the Trial Protocols along with their manuscript. The CONSORT (Consolidated Standards of Reporting Trials) Checklist and Flowchart are also required when submitting the results of randomized control trials (RCTs). Lu M, Taylor A, Chylack LT, et al. Dietary linolenic Acid intake is positively associated with five-year change in eye lens nuclear density. J Am Coll Nutr 2007; 26: 133-40. Nocentini G, Ronchetti S, Cuzzocrea S, Riccardi C. GITR/GITRL: more than an effector T cell co-stimulatory system. Eur J Immunol 2007; 37: 1165-9. Jensen IB, Hodder RL, Dollhopf DJ. In: Wali MK, Ed. Effects of Surface Manipulation on the Hydrologic Balance of Surface Mined Lands. Ecology and Coal Resource Development, Pergamon Press, New York 1978; 754-61. Munshower FF. Disturbed land revegetation, Lewis Publishers, Boca Raton, FL., 1994; pp. 265. Santaniello V, Evenson RE, Zilberman D, Carlson GA. Eds. Agriculture and intellectual property rights: Economic, institutional, and implementation issues in biotechnology. CABI Publishing, 10 E 40th St., Suite 3203, New York, NY 10016, 2000. Abbott K, Seymour J. Trapping the papaya fruit fly in north Queensland. Paper presented at the Australian Entomological Society Conference, Melbourne, September 20, 1997. Goss K, Chisholm T, Graetz D, Noble I, Barson, M Australian Agronomy Conferences. Proc. 5th (Perth), 6th (Armidale) and 7th (Adelaide) Conferences, 1989, 1991 and 1993. In: Sustaining the agricultural resource base. Office of the Chief Scientist, Dept. of the Prime Minister and Cabinet, AGPS Canberra 1995. Bicknell RA, Koltunow AM. Understanding apomixes: recent advances and remaining conundrums. Plant Cell 2004; 16 (Suppl): S228-45. Scholtz MT, Bidleman TF. Modelling of the long-term fate of pesticide residues in agricultural soils and their surface exchange with the atmosphere: Part II. Projected long-term fate of pesticide residues. Sci Total Environ 2007; 377(1 Pt 2): 61-80. Bruselman E, Steurbaut W, Sonck B. Optimizing the application of entomopathogenic nematodes. Commun Agric Appl Biol Sci 2006; 71(3 Pt A); 701-5. Spiering BA, Carter GA, inventors; Plant chlorophyll content imager with reference detection signals.United States patent US 20006114683. 2000 Sep.
All authors must strictly follow the guidelines below for preparing illustrations for publication in The Open Biotechnology Journal. If the figures are found to be sub-standard, then the manuscripts will be rejected. The publication fee includes basic copy editing services. Once the paper is accepted for publication, the author will receive an electronic invoice via email. Subsequent submissions from the Bentham OPEN Authors will receive a discount of US$ 100 on the total publication charges provided their previous submission did not avail any discount off the listed full author open access fee rate. Please click here to download the Fee Form.